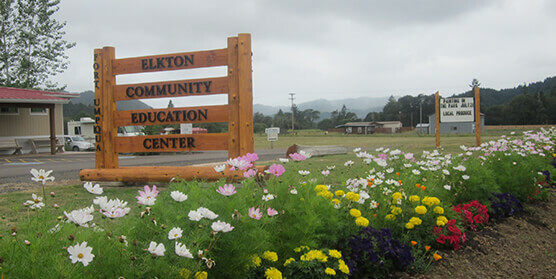 ECEC is the vision of Carol Beckley, a retired teacher with a passion for mentoring young people, cultivating native plants and promoting Elkton. ECEC became an independent nonprofit in 1999 when Carol purchased a sheep field and invited local residents to create projects that enrich the community. Over the years, it has evolved into a full-service community center and a popular summer tourist destination. More than 100 volunteers work with part time staff to keep ECEC beautiful and open to the public. While best known for our Butterfly Pavilion and replica of historic Fort Umpqua, ECEC also serves as the local library, gathering spot and informal visitors center. Our Summer Youth Employment Program is the largest source of off-farm income and job training for area high school students. Each year we host close to 5,000 visitors from near and far, including an increasing number of tourist from across the country and around the world. See what people are saying about ECEC. Our long term goal is to keep Elkton a vibrant, thriving rural community for future generations. Job training and employment for local youth that will help them be successful in their future careers, and opportunities for people of all ages to develop new skills that expand their horizons. Educational programs that celebrate and advance the natural environment and human history of the Umpqua River valley. Social and cultural events that connect local residents, attract visitors and enhance the quality of life in our area. A business model that provides a stable and diversified source of income for our organization, has a positive economic impact throughout the community, and shares what we’ve learned with others. What will I see at ECEC?